MLM Gateway is unique, simple and easy to use social platform for network marketers from all over the world. MLM Gateway members are able to connect with each other and build business relationship. Generating leads is crucial in the world of network marketing and our website helps independent business owners to meet like-minded people and quickly expand their entrepreneurship. New members signs up every day and convince themselves about the usefulness of MLM Gateway. Since most of the members have already experience with home based business and multilevel marketing, it's much easier to talk to them about new business opportunities. This represents effective MLM lead generation system every network marketing distributor is looking for. Sign up and basic features are free. However, if a member wants to take a full advantage of this business building system, he is encouraged to buy additional credit packs so he can contact more business partners, get more leads and run advertising campaigns. MLM Gateway allows its members to contact highly qualified prospects with multilevel marketing experience. The site is open for people from all over the world so it is possible to create a partnership with people from other countries as well. This website is also intended for those who don’t run a network marketing business yet. 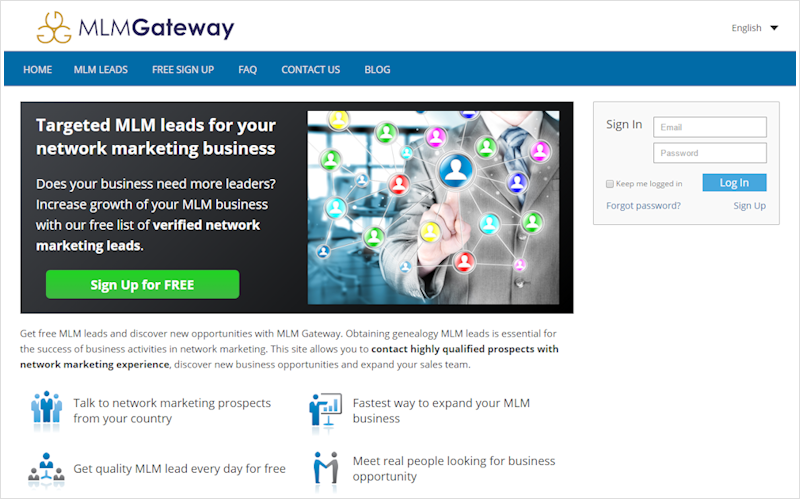 MLM Gateway provides them the opportunity to connect with independent business owners who have knowledge, skills and experience in network marketing. Members can publish business announcements and promote their business to other members and all visitors of the website. They can even share regular quick updates with the members they are connected to. In short, MLM Gateway provides its members the possibility to generate highly-targeted network marketing leads and get their contact information so they can build relationships with them. Through our member advertising system they can even drive traffic to their own website.